Lover of Justice, obedient to the Father’s will, pray for us. Intercessor of Cana, compassionate toward the unfortunate, pray for us. Immaculate Heart, pierced by a sword, pray for us. Patient Mother, doer of God’s will despite atrocity, pray for us. Faithful Mother, at the foot of the cross, pray for us. Faithful Mother, unashamed of your Son, pray for us. Faithful Mother, faithful to the innocent, pray for us. Healing Mother, guardian and nurse of the Body of Christ, pray for us. Loving Mother, fierce lover of the Body of Christ, pray for us. Loving Mother, unvengeful despite disaster, pray for us. Trusting Mother, helping us to do whatever He tells us, pray for us. Prayerful Mother, believing despite corruption, pray for us. Faithful Mother, unwilling to abandon your Son, pray for us. Faithful Mother, peaceful in the face of calumny heaped upon your Son, pray for us. Peaceful Mother, faithful in the face of scandal, injustice, and humiliation, pray for us. Model of Fidelity, caressing your Son’s tortured and bloodied body, pray for us. Rewarded Mother, witness to the Resurrection, keep us faithful to the end that we too may receive our reward. Christ, warner of Pharisees and scribes, hear our prayer. Christ, bringer of the sword, hear our prayer. Christ, unbelieved though truthful, hear our prayer. Christ. betrayed with a kiss, hear our prayer. Christ, tried though innocent, hear our prayer. Christ, found guilty though innocent, hear our prayer. Christ, condemned though innocent, hear our prayer. Christ Reviled, hear our prayer. Christ Scourged, hear our prayer. Christ Wounded, hear our prayer. Christ Mocked & Humiliated, hear our prayer. Christ Spat Upon, hear our prayer. Christ Crowned with Thorns, hear our prayer. Body of Christ Suffering, hear our prayer. Christ Carrying Your Cross, hear our prayer. Christ Fallen Three Times, hear our prayer. Christ Crucified, hear our prayer. Christ Abandoned, hear our prayer. Christ, forgiving from the cross, help us to love and forgive one another as you love and forgive us. Christ Expired, hear our prayer. Christ in the tomb, hear our prayer. Christ Risen, turn our mourning into joy, for all things are possible with You and You make all things new. Christ Risen, make us one, as You and the Father and the Paraclete are One. Christ Risen, heal our wounds and call us to new life. Christ Triumphant, Alpha & Omega, Beginning & End, First & Last, resolve all things according to Your Holy Will. Christ Final Judge, have mercy on us, and welcome us into the Heavenly Banquet. Christ True High Priest, keep us faithful to our baptismal promises. © 2009, Matthew P. McCormick. All rights reserved. Let us pray for the Church. Let us pray for each other. 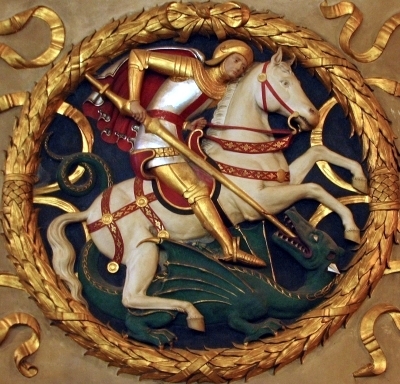 In Christian hagiography, Saint George – The Saint who killed the Dragon (ca. 275-281?-April 23, 303) was a soldier of the Roman Empire, from Anatolia, now modern day Turkey, who is venerated as a Christian martyr. George was born to a Christian family during the late 3rd century. His father, Geronzio, was from Cappadocia and served as an officer of the Roman army, but was killed in battle. 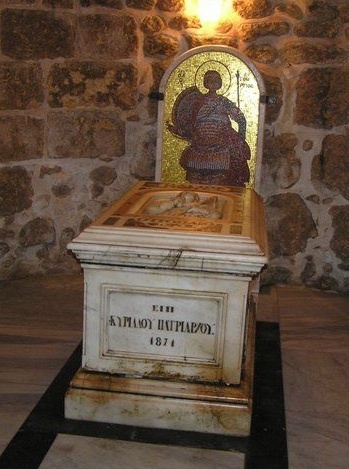 His mother, Policronia, was from Lydda, Iudaea (now Lod, Israel). She returned to her native city as a widow along with her young son, where she provided him with an education. The youth followed his father’s example by joining the army soon after coming of age. He proved to be a good soldier and consequently rose through the military ranks of the time. By his late twenties he had gained the title of Tribunus (Tribune) and then Comes (Count), at which time George was stationed in Nicomedia as a member of the personal guard attached to Roman Emperor Diocletian, who embraced him, having known and regarded his father as one of his finest soldiers. In 303 Diocletian, influenced by Galerius, issued an edict authorizing the systematic persecution of Christians across the Empire. The emperor Galerius would continue the persecution during his own reign (305-311). George was ordered to take part in the persecution but instead confessed to being a Christian himself and criticized the imperial decision. Diocletian was upset, not wanting to lose his best Tribune and the son of his former best official. George loudly denounced the Emperor’s edict, and in front of his fellow soldiers and Tribunes he claimed himself to be a Christian and declared his worship of Jesus Christ. Diocletian attempted to convert George, even offering gifts of land, money and slaves if he made a sacrifice to the pagan gods. The Emperor made many offers, but George never accepted. An enraged Diocletian ordered the torture of this apparent traitor, and his execution. Before the execution George gave his wealth to the poor and prepared himself. 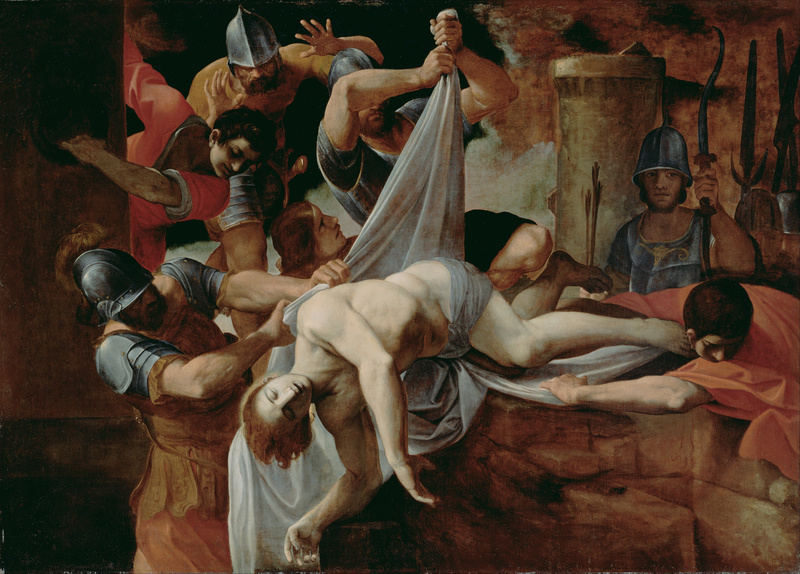 After various tortures, beginning with being lacerated on a wheel of swords in which he was revived three times, George was executed by decapitation before Nicomedia’s defensive wall on April 23, 303. The witness of his suffering convinced Empress Alexandra and Athanasius, a pagan priest, to become Christians as well, and so they joined George in martyrdom. 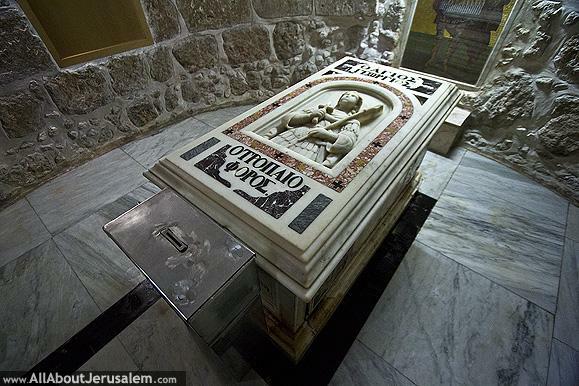 His body was returned to Lydda for burial, where Christians soon came to honor him as a martyr. Saint George is one of the most venerated saints in the Eastern Orthodox Church and Oriental Orthodox Churches. Immortalized in the tale of George and the dragon, he is the patron saint of Canada, Catalonia, England, Ethiopia, Georgia, Greece, Montenegro, Portugal, Serbia, the cities of Beirut, Istanbul, Ljubljana and Moscow, as well as a wide range of professions, organizations and disease sufferers. In the legend of St George and the dragon, brought back to Europe by Crusaders, a dragon makes its nest at the spring that provides water for the city of Cyrene in Libya or the city of Lydda, depending on the source you consult. Consequently, the citizens have to dislodge the dragon from its nest for a time, in order to collect water. To do so, each day they offer the dragon a human sacrifice. The victim is chosen by drawing lots. One day, this happened to be the princess. The monarch begs for her life with no result. She is offered to the dragon, but there appears the saint on his travels. He faces the dragon, slays it and rescues the princess. The grateful citizens abandon their ancestral paganism and convert to Christianity. In Sweden, the princess rescued by Saint George is held to represent the kingdom of Sweden, while the dragon represents an invading army. Several sculptures of Saint George battling the dragon can be found in Stockholm, the earliest inside Storkyrkan (“The Great Church”) in the Old Town. 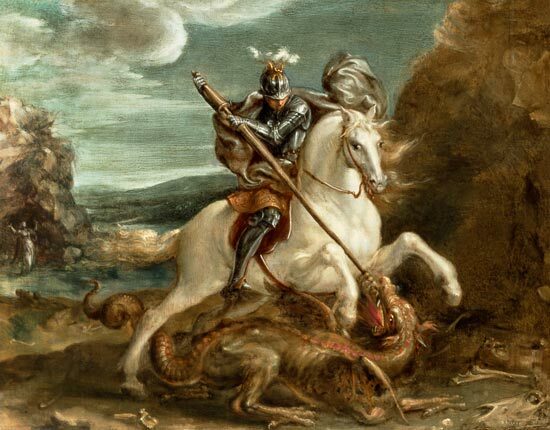 O God, You granted Saint George strength and constancy in the various torments which he sustained for Holy Faith; we beseech You to preserve, through his intercession, our faith from wavering and doubt, so that we may serve You with a sincere heart faithfully unto death. Through Christ our Lord. Amen. Faithful servant of God and invincible martyr, Saint George; favored by God with the gift of faith, and inflamed with an ardent love of Christ, you fight valiantly against the dragons of pride, falsehood, and deceit. Neither pain nor torture, sword nor death could part you from the love of Christ. I fervently implore you, for the sake of this love, to help me by your intercession to overcome the temptations that surround me, and to bear bravely the trials that oppress me, so that I may patiently carry the cross which is placed upon me; and let neither distress nor difficulties separate me from the love of Our Lord Jesus Christ. O, Valiant Champion of Faith, assist me in the combat against evil, that I may win the crown promised to them that persevere unto the end. “Saint George was a man who abandoned one army for another: he gave up the rank of tribune to enlist as a soldier for Christ. Eager to encounter the enemy, he first stripped away his worldly wealth by giving all he had to he poor. Then, free and unencumbered, bearing the shield of faith, he plunged into the thick of the battle, an ardent soldier for Christ. Clearly what he did serves to teach us a valuable lesson: if we are afraid to strip ourselves of our worldly possessions, then we are unfit to make a strong defense of the faith. Anyone who has worked in loneliness, with great adaptation required, and with little apparent success, will find a kindred spirit in Peter Chanel. Pierre Louis Marie Chanel was born on July 12, 1803 in La Potière near Cuet in the area of Belley, France. He was ordained priest along with 24 others on 15 July 1827. From an early age Chanel had been thinking about going on the foreign missions and his intention was strengthened by the letters that arrived from a missionary in India. The following year Chanel applied for permission to go to the missions. His application was not accepted and instead he was appointed for the next three years as parish priest of the run down parish of Crozet. This parish was in dire straits and situated in a seamy district. By the simple method of showing great devotion to the sick, Peter revitalized and reinvigorated the faith of the community surrounding the parish. Seeming to take one step closer to his ambition of becoming a missionary, in 1831, Peter joined the newly forming Society of Mary (Marists). 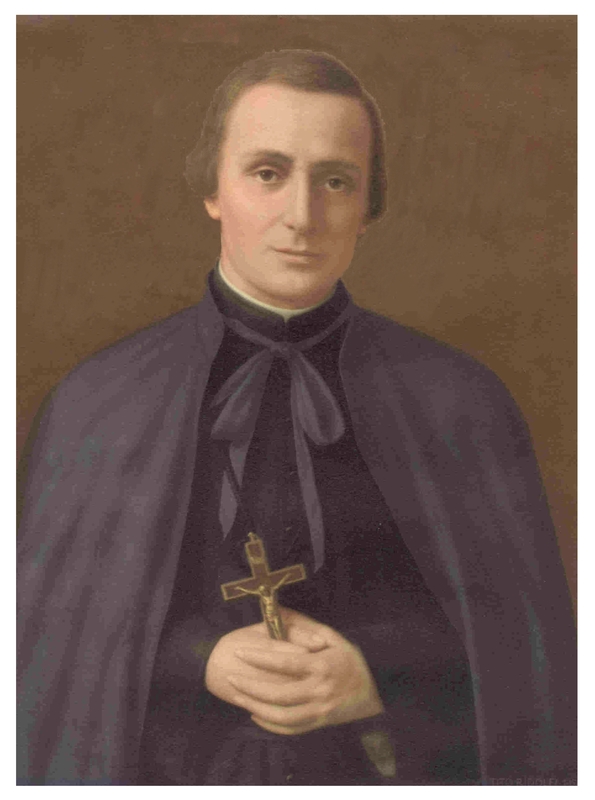 Instead of being selected as a missionary, however, the Marists used his talents as the spiritual director at the Seminary of Belley, where he patiently and obediently worked for five years. Finally, he was given permission to be a missionary and traveled to Western Oceania. The bishop accompanying the missionaries left Peter and another Marist brother on Futuna Island in the New Hebrides, promising to return in six months. The interval lasted five years. The group was initially well received by the island’s king, Niuliki, who had only recently forbidden cannibalism. Meanwhile Peter struggled with this new language and mastered it, making the difficult adjustment to life with whalers, traders and warring natives. Despite little apparent success and severe want, Peter maintained a serene and gentle spirit and endless patience and courage. A few natives had been baptized, a few more were being instructed. Once the missionaries learned the local language and began preaching directly to the people, the king grew restive. He believed that Christianity would take away his prerogatives as high priest and king. When the king’s son, Meitala, sought to be baptized, the king sent a favored warrior, his son-in-law, Musumusu to “do whatever was necessary” to resolve the problem. Musumusu initially went to Meitala and the two fought. Musumusu, injured in the fracas went to Chanel feigning need of medical attention. While Chanel tended him a group of others ransacked his house. Musumusu took an axe and clubbed Chanel on the head. His body was cut to pieces by the natives. Over a year later, for it took that long for news to travel of Peter’s murder and arrangements to be made, a chief named Maligi, who had not agreed to Chanel’s murder, agreed to disinter Fr. Chanel’s body, and brought it to the L’Allier, a French naval corvette, sent to retrieve Peter’s body, wrapped in several local mats. Eventually, with proper and improved care taken of the remains, entrusted from trustworthy hand to trustworthy hand, Peter’s remains were returned to the motherhouse of the Society of Mary in Lyon, France, June 1, 1850. Within two years after Peter’s death, some sources say five months, the whole island of Futuna became Catholic and has remained so. Musumusu himself converted, and as he lay dying, expressed the desire that he be buried outside the church at Poi so that those who came to revere Peter Chanel in the Church would walk over his grave to get to it. As a kind of penitence a special action song and dance, known as the “eke”, was created by the people of Futuna shortly after Chanel’s death. The dance is still performed in Tonga. Peter Chanel’s remains were returned to Futuna in 1977. 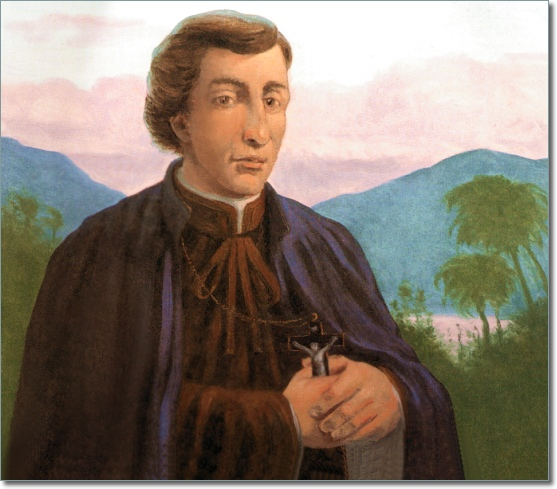 St Peter Chanel, you left your homeland to proclaim Jesus, Savior of the world, to the peoples of Oceania. Guided by the spirit of God, who is the strength of the gentle, you bore witness to love, even laying down your life. Grant that like you, we may live our daily life in peace, joy, and in love. May your prayer and example call forth from our midst many workers for the Gospel so that God’s kingdom may reach to the ends of the earth. Amen. St Catherine of Siena, OP, one of the Great Reformers of the Catholic Church, publicly excoriated priests, bishops, cardinals, and popes. She called them “wretches”, “idiots”, “blind hirelings”, and “devils incarnate”. Catherine sought to shame the clergy into reform; her methods and her inspiration for reform were direct and challenging. Catherine claimed that her reform rhetoric was revealed to her in a series of visions. The legitimacy of these visions was reinforced by Catherine’s miracles. 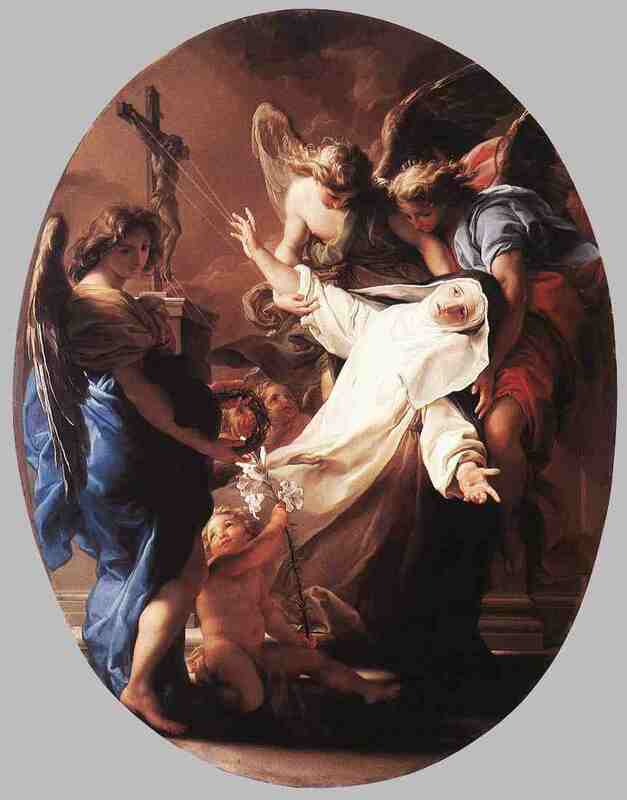 From early in her career, she was known for her miraculous ability to subsist solely on the Eucharist, and was given the grace of the stigmata, the wounds of Christ, during her life, among other supernatural phenomena. 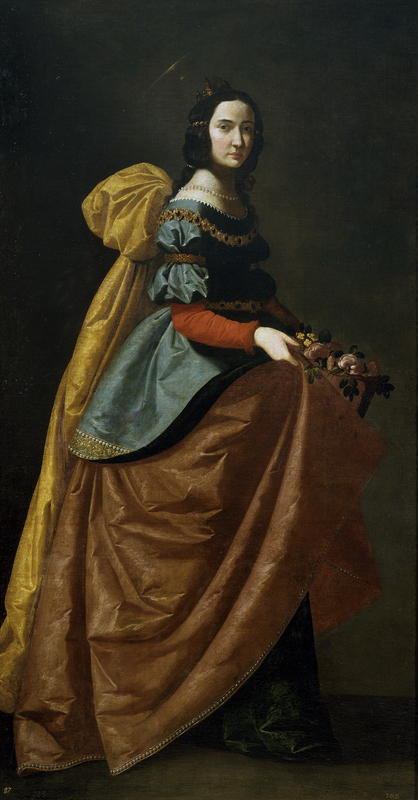 Born Catherine Benin in Siena, Italy, to Giacomo di Benincasa, a clothdyer, and Lapa Piagenti, possibly daughter of a local poet, in 1347, she was the last of 25 children. A year after she was born, the Black Death, or bubonic plague, came to Siena for the first time. Sometime around 1353, at the age of seven or eight, Catherine experienced a vision of Christ that led her to make a vow of virginity. In about 1366, Catherine experienced what she described in her letters as a “Mystical Marriage” with Jesus. Her biographer also records that she was told by Christ to leave her withdrawn life and enter the public life of the world. Catherine dedicated much of her life to helping the ill and the poor, where she took care of them in hospitals or homes. Just as Catherine was not repulsed by the filth of her neighbors’ diseased bodies, she was also not repulsed by the corruption manifested in the body of Christ. For most of her career, she tended to the sick, the hungry, and the dying, much like Blessed Teresa of Calcutta has done in our own day. She wrote many letters to religious leaders and secular officials of her day encouraging and demanding, under penalty of perdition, reform, peace, order, atonement, repentance, reconciliation, and adherence to the Gospel. 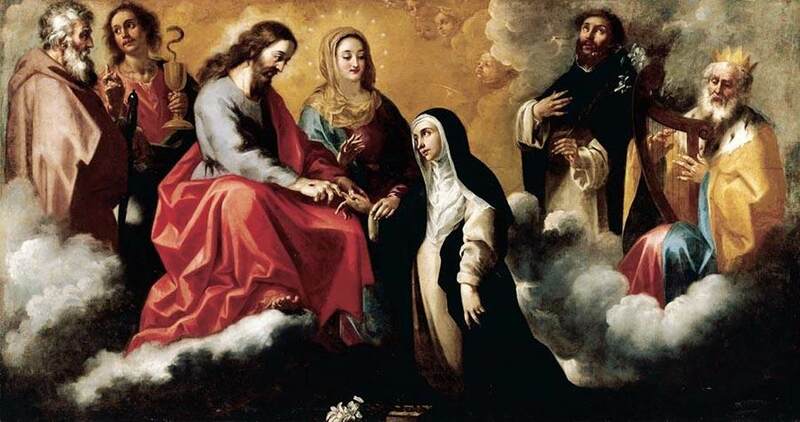 Her other work, “The Dialogue of Divine Providence”, is one of the most well known works in Catholic mystical writing, referred to simply as St Catherine’s “Dialogue”, or “The Dialogue”. Its premise is a dialogue between a soul who “rises up” to God and God, and was recorded by her followers between 1377 and 1378. She opens with a description of sin and the need for penance. She synthesizes both the apologetics of love and of humility under the rubric of the atonement for sin. 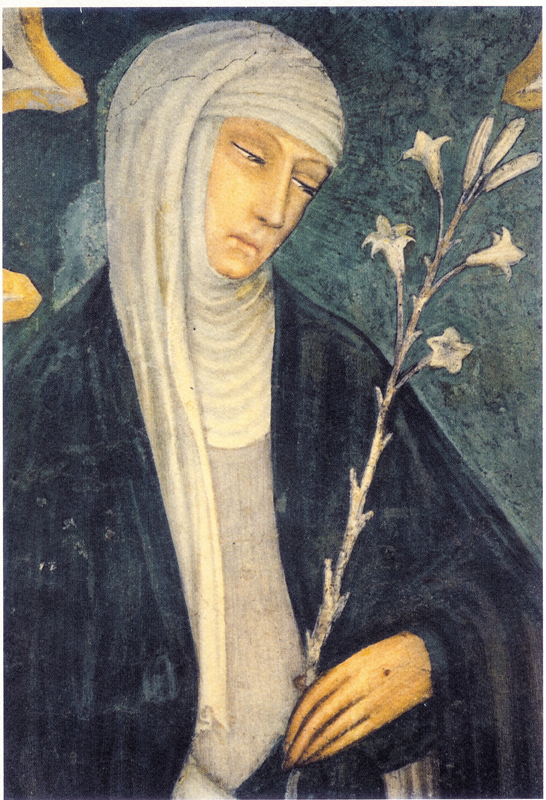 Saint Catherine of Siena in her Dialogue writes about tears. She describes the different ways that God uses our sadness to bring us into ever closer union with Him. We are sad when we encounter the emptiness of sin and the fear of eternal punishment. These turn us away from sin and toward virtue. Those who begin to turn away from sin, however, still lose the things they love, from worldly goods to beloved friends. Those who have grown accustomed to feeling close to God may even feel, for a time, a loss of spiritual consolation, as if God were withdrawing from them. These losses also lead to sadness, although of a very different quality and for different reasons. This helps to purify love of its selfishness, so that the soul may turn more and more to God. Even sadness due to evils committed against God and the people that we love can bring us closer to God, because we can unite our suffering with the suffering of Jesus on the cross. God uses our sadness to lead us to Him. 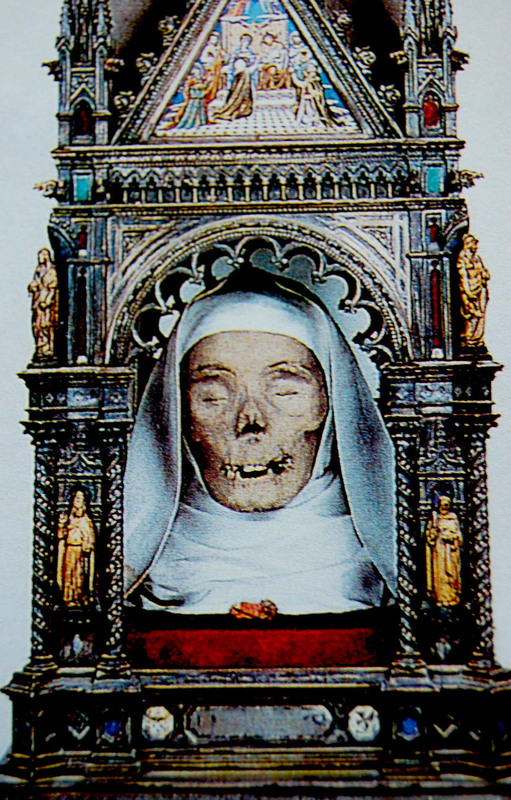 St Catherine died of an apparent stroke in Rome, in the spring of 1380, at the age of thirty-three. She was proclaimed a Doctor of the Church in 1970, one of only three women and thirty men to hold this title in the history of Christianity. “O Deity eternal, O high, eternal Deity, O sovereign, eternal Father, O ever-burning fire!… What do Your bounty and Your grandeur show? The gift You have given to man. And what gift have You given? Your whole self, O eternal Trinity. And where did You give Yourself? In the stable of our humanity which had become a shelter for animals, that is, mortal sins” -St. Catherine of Siena. O Bread of Angels, sovereign, eternal purity, You ask and want such transparency in a soul who receives You in this sweet Sacrament, that if it were possible, the very angels would have to purify themselves in the presence of such an august mystery. How can my soul become purified? In the fire of Your charity, O eternal God, by bathing itself in the Blood of Your only-begotten Son. O wretched soul of mine, how can you approach such a great mystery without sufficient purification? I will take off, then, the loathsome garments of my will and clothe myself, O Lord, with Your eternal will!” (St. Catherine of Siena). The polarization in the Church today is a mild breeze compared with the tornado that ripped the Church apart during the lifetime of this saint. 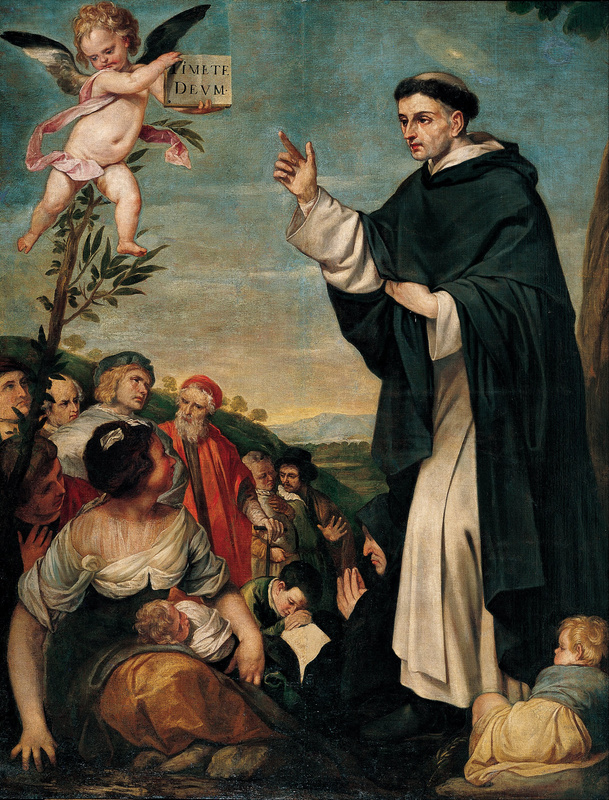 If any saint is a patron of reconciliation, St. Vincent Ferrer, OP, is. Born in Valencia, Spain, January 23, 1350, the fourth child and second son of William Ferrer and Constantia Miguel, and named in honor of St Vincent Martyr, patron of Valencia, whom we considered back in January of this year. Vincent’s birth was anything but a quiet affair! It is said that his mother, who was accustomed to difficult pregnancies, experienced only an indescribable goodness and joy at the birth of her son. This experience was accompanied by Vincent’s father’s dream in which a Dominican friar announced to him that his son would one day enter the Order of Preachers and his fame would spread throughout the world. A poor blind woman, when giving thanks to the mother of the saint for alms, astounded her by prophesying, “O happy mother, it is an angel that you bear, and one day he will give me my sight!” It is recorded that the woman did receive her sight. 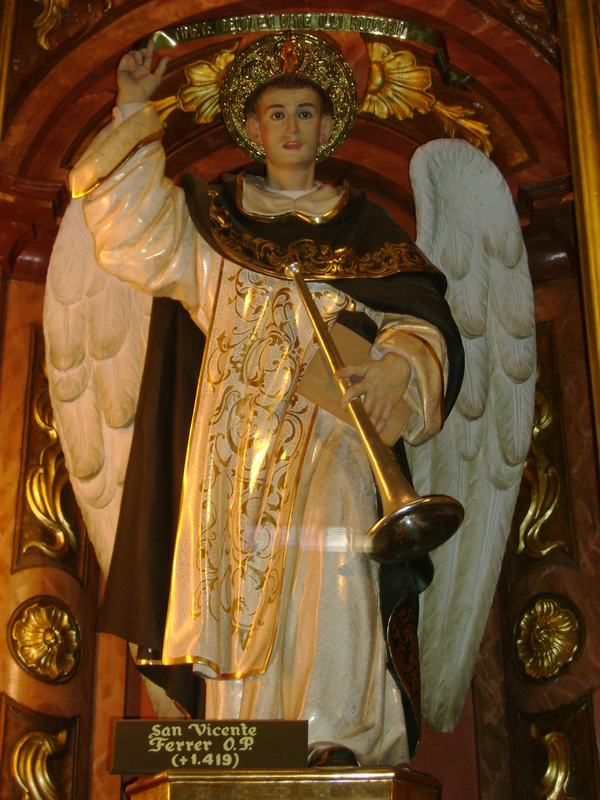 Despite parental opposition, Vincent Ferrer entered the Dominican Order in his native Spain at 19. After brilliant studies, he was ordained a priest by Cardinal Peter de Luna—who would figure tragically in his life. 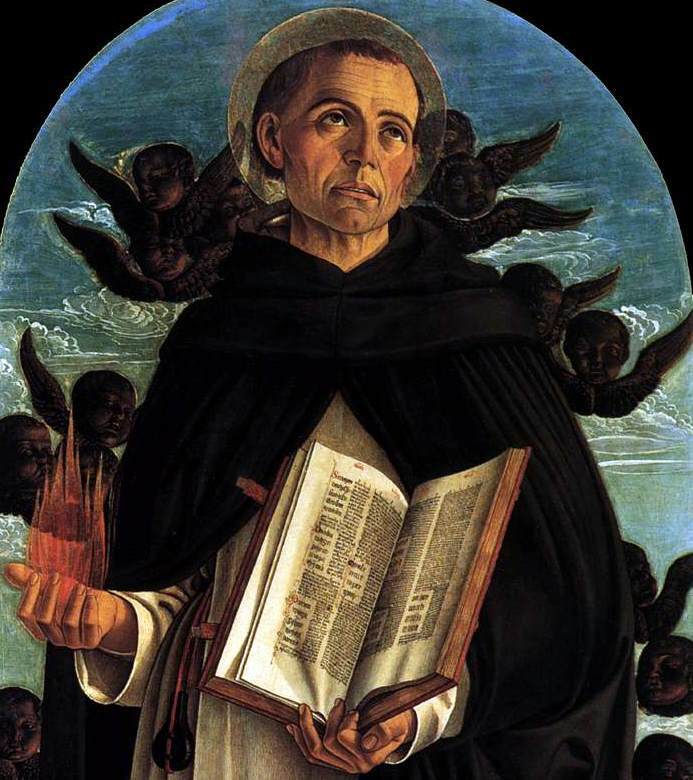 Contemporary evidence pictures St. Vincent Ferrer to have been a man of medium height, with a lofty forehead and very distinct features that seemed to inspire a sense of reverence and awe in all who knew him. His hair was fair in color and shaven in the form of a monastic tonsure, which is said to have resembled an areola of glory around his head. His eyes were very dark, very expressive, and full of fire, which were tempered, however, by his ever gentle manner. Pale as was his ordinary color, it is said that he became slightly ruddy when preaching. Although his handsomeness faded in later years as a result of his arduous labors and the austerities that he practiced, it became changed rather than vanished. His countenance took on a transparent peacefulness or glow that seemed to be the reflection of the inward beauty of his great spirit that was aflame with the love of God and of his neighbor. His voice was strong and powerful, at times gentle, resonant, and vibrant as it seemed to search deeply the heart and to inspire fear when fear was needed and to soothe with exquisite tenderness when comfort was needed. Of a very ardent nature, Vincent practiced the austerities of his Order with great energy. He was chosen prior of the Dominican house in Valencia shortly after his ordination. During a severe fever in 1398, Vincent had a vision of Christ, Saint Dominic de Guzman and Saint Francis of Assisi. It was a life changing experience – Vincent received supernatural gifts and he believed that he was instructed in his vision to be a messenger of penance, an “angel of the apocalypse” sent to prepare humankind for the Judgment of Christ. 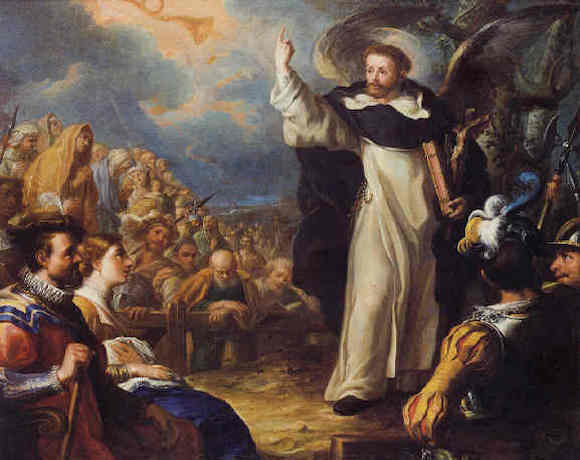 St. Vincent Ferrer was a great preacher who converted thousands in Spain, France, Italy, Germany, the Netherlands, England, Scotland, and Ireland. He was invited to preach in Muslim Granada. He slept on the floor, had the gift of tongues (he spoke only Spanish, but all listeners understood him), lived in an endless fast, celebrated Mass daily, and was known as a miracle worker – reported to have brought a murdered man back to life to prove the power of Christianity to the onlookers, and he would heal people throughout a hospital just by praying in front of it. He worked so hard to build up the Church that he became the patron of people in building trades. The Great Western Schism (1378-1417) divided Christianity first between two, then three, popes. Clement VII lived at Avignon in France, Urban VI in Rome. Vincent was convinced the election of Urban was invalid (though St. Catherine of Siena was just as devoted a supporter of the Roman pope). In the service of Cardinal de Luna, he worked to persuade Spaniards to follow Clement. When Clement died, Cardinal de Luna was elected at Avignon and became Benedict XIII. At the beginning of the 14th century, following a disagreement between Pope Boniface VIII and King Philip the Fair(handsome) of France, who was immorally ambitious, a French pope, Clement V, was elected. Within four years, civil unrest in Rome and riots between rival factions drove Clement V to take shelter with the Dominican order in Avignon. The move was intended to be temporary, but a number of factors combined to make it a longer sojourn. Known as the “Babylonian Captivity” of the papacy, the schism was eventually resolved by the Council of Constance (1414-1418). Cardinals from both sides had previously met at Pisa in 1409, and trying to end the schism, elected a third pope. The rift was not healed until the Council of Constance vacated all three seats and elected Martin V as pope in 1417. Vincent worked for his friend, Benedict XIII, as apostolic penitentiary and Master of the Sacred Palace in Avignon. But the new pope did not resign as all candidates in the conclave had sworn to do. Benedict XIII remained stubborn despite being deserted by the French king and nearly all of the cardinals. He tried, again, unsuccessfully, in 1408 and 1415, to persuade his former friend to resign. He finally concluded that Benedict was not the true pope. Though very ill, he mounted the pulpit before an assembly over which Benedict himself was presiding and thundered his denunciation of the man who had ordained him a priest. Benedict fled for his life, abandoned by those who had formerly supported him. Strangely, Vincent had no part in the Council of Constance, which ended the schism. The split in the Church at the time of St Vincent Ferrer, OP, should have been fatal—36 long years of having two “heads.” We cannot imagine what condition the Church today would be in if, for that length of time, half the world had followed a succession of popes in Rome, and half, an equally “official” number of popes in, say, Rio de Janeiro. It is an ongoing miracle that the Church has not long since been shipwrecked on the rocks of pride and ignorance, greed and ambition. Contrary to Lowell’s words, “Truth forever on the scaffold, wrong forever on the throne,” we believe that “truth is mighty, and it shall prevail”—but it sometimes takes a long time. 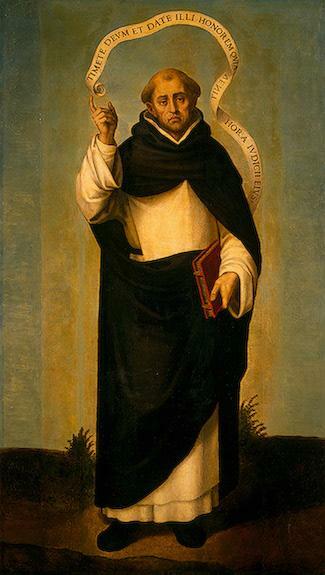 O my protector, St. Vincent Ferrer, as the eternal God has deposited in you an inexhaustible treasurer of grace and of supernatural virtues, hear my earnest petition, and help me with your intercession, more powerful now even than when you were on earth. Hence with blind confidence do I cast myself at your feet, there to place my requests for all those in whom I am concerned but more particularly for (special favor). O glorious saint, let not my confidence in you be deceived. Present for me, to the Divine Majesty, your suppliant prayers and watch over my soul. Should sorrow and trials increase, so also will my rejoicing increase, and may my patience grow with each day, that I may thus save my soul. Amen. 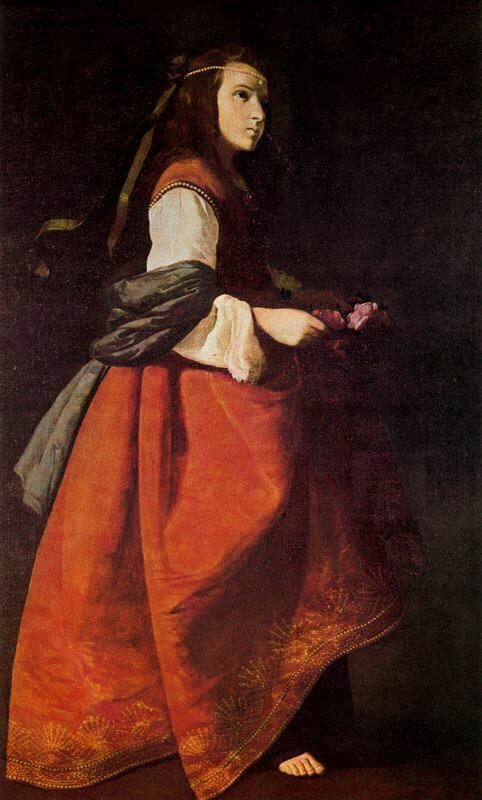 St. Casilda was the daughter of a Muslim leader called Almacrin or Almamun in Toledo, Spain, in the 10th century. Casilda was herself raised as a Muslim and showed special kindness to Christian prisoners, carrying bread to them hidden in her clothes. Once, she was stopped by Muslim soldiers and asked to reveal what she was carrying in her skirt. When she began to show them, the bread turned into a bouquet of roses. Casilda became ill as a young woman but was not convinced that any of the local Arab doctors could cure her. So, she made a pilgrimage to the shrine of San Vicenzo (Saint Vincent Martyr, whom we considered in January) in northern Spain. Like so many other people who made their way there—many of them suffering from hemorrhages—Casilda sought the healing waters of the shrine. We’re uncertain what illness brought her to the shrine, but we do know that she left it relieved of illness. You know of my passion in particular for married saints. James Duckett was born at Gilfortrigs, Westmorland in England. He lived at a time when Elizabeth I was Queen of England. As a young man he became an apprentice printer in London. There he came across a book called “The Firm Foundation of the Catholic Religion” by Jean de Caumont, published first in Antwerp in 1590, available for viewing and reading online even today, and lent to him by a friend. He studied the book carefully and believed that the Catholic Church was the true Church. In those days, Catholics were ill-treated in England. 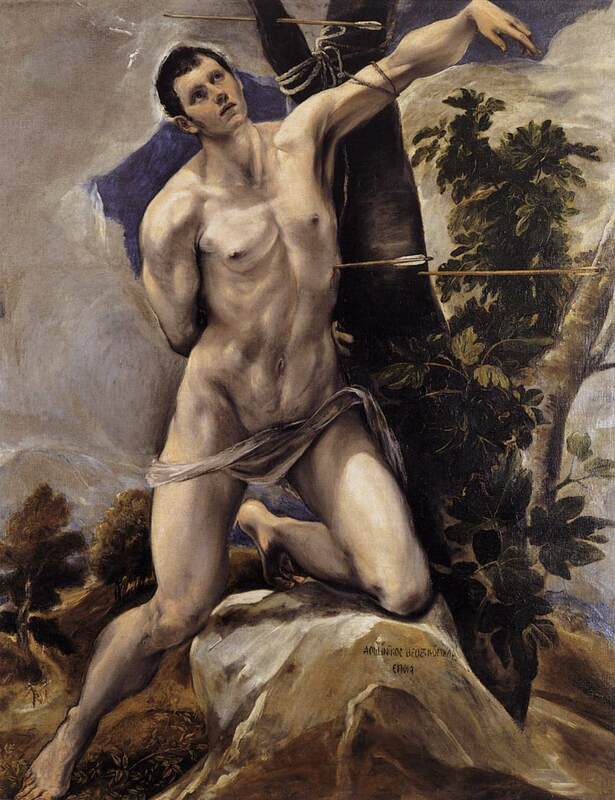 James decided that he wanted to be a Catholic anyway and would bravely face any trouble that came his way. The minister from his previous church came to look for him because James had been a regular church goer, attendance was mandatory by law. James refused to go back, saying he would not return until better arguments for the Anglican faith were made to him. He was sent to prison twice for his stubbornness and both times the owner of the printing press he worked for helped free him. But then the man asked James to find himself another job. James Duckett knew there was no turning back and was able to find a disguised Catholic priest in the Gatehouse prison. The old priest, “Mr. Weekes,” taught him about the Catholic faith and soon James Duckett was received into the Catholic Church. 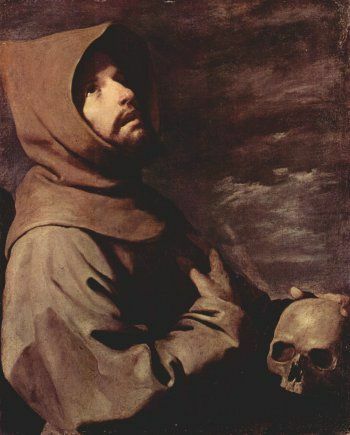 He married a Catholic widow and their son became a Carthusian monk. Blessed James Duckett never forgot that it was a book that had changed his life. He made it his duty to provide his neighbors with Catholic books as he knew these books would help encourage and teach them about the faith and the Catholic Church. So dangerous was this work that he was in prison for nine years out of the twelve that he was married. Finally, he was condemned to death by one man’s witness. Peter Bullock, a book binder who testified that he had bound Catholic books for Blessed James, a very “serious crime” in England at the time. Blessed James admitted the truth of this in court in a very self-possessed manner and with a calm demeanor. It was unheard of to condemn a man on testimony of only one witness, so the jury found Blessed James not guilty, initially; but the judge, Sir John Popham, the Lord Chief Justice, browbeat the jury, which reversed its verdict and Blessed James was found guilty of felony. Peter Bullock turned traitor because he himself was sent to prison for a true crime and hoped to be set free, but he was not freed and was condemned alongside Blessed James. Both Blessed James and his betrayer were sent to die on the same day, carted to the gallows at Tyburn. Along the way, Blessed James’ wife presented him with a pint of wine. He drank a glass of it and urged her to drink one in honor of Bullock, and hold no grudge against him. When she refused, Blessed James chided her until she did. Before they were hanged, Blessed James Duckett kissed his betrayer and told Bullock that he was forgiven. He kept encouraging the man as they were dying to accept the Catholic faith. Then the ropes were placed around their necks. Blessed James Duckett was martyred and died for his faith April 19, 1602. He is remembered among those lifelong laity recognized for their sanctity. In my prayer currently, I am struggling, as I am sure many of you are and have. I think it is important to remember, when we are tempted to discouragement, as we certainly must often be in these days, that it is the Lord who calls us to faithfulness. This knowledge and reflection comforts me. This comfort is reinforced by my hagiography. Each of the great Catholic reformers lived in a time where no one would have questioned their discouragement, their choice to distance themselves or to not get involved. Despite their discouragement, they remained faithful, vibrant, alive in their faith. They struggled. They suffered. With the grace of the Holy Spirit, they persevered. Let us imitate them. This is the beauty of their vocation as Catholics – lay or ordained. Let us pray for each other, for the Church, for struggling, lapsed, and all Catholics and for our brothers and sisters in Christ in whom we find the most disappointment. I rejoice when I remember the Lord perseveres in His love for me, despite what must be His profound disappointment in me. Let us imitate Him in this, too, with each other. Another married saint, born to a well-to-do family at Lodi, Italy, James Oldo knew how to have a good time in his youth. He was the life of the party. Self-indulgent and pleased with himself and quite self-satisfied, James sought out the company of others like himself, eventually marrying his wife, Catharine, who also liked to have a good time and enjoyed being popular. With their soon-to-be-born three children, all seemed well and the future seemed bright for the Oldos. But, God had other plans for James and Catharine, who might not have agreed with God’s intentions for them, had they known. Regardless of their would-be displeasure, God has a way of getting His way. An outbreak of plague drove James, his wife and their three children out of their home and into the countryside. Despite those precautions, two of his daughters died from the plague. Faced with his own mortality, James began to reevaluate. 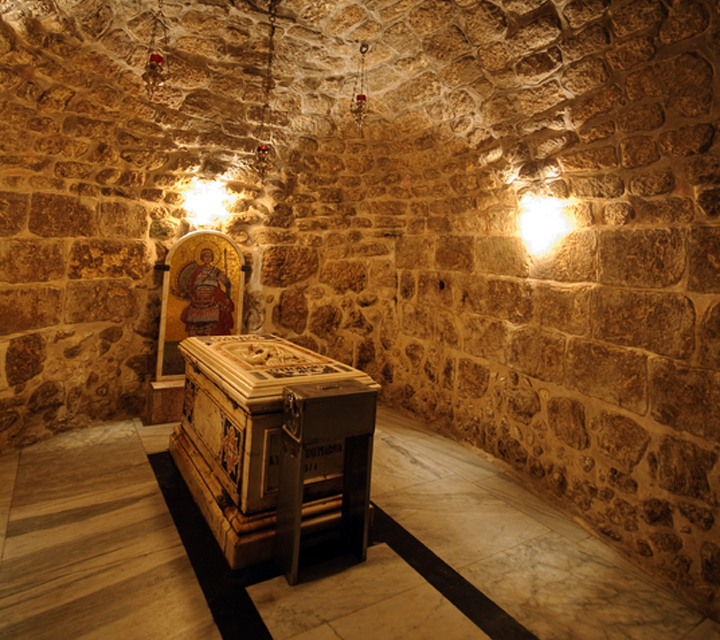 Still, only slightly shaken from the death of his children, a traveling replica of the Holy Sepulchre came to town one day for veneration by the people. Thinking it a huge joke, James decided he would test to see who was taller, him or Christ. James climbed into the shrine and lay in the mock tomb, attempting to mock it. We do not know exactly what happened next to James Oldo at that very moment, but we do know he had a profound instantaneous conversion experience, while laying where it was intended the Resurrected Body of the Lord was supposed to have lain, James emerged a changed man. James decided he would become a secular Franciscan. His wife and his mother could not comprehend what had happened to their son and husband. They opposed this new direction and radical change in the life of James. That is, until James’ mother had a vision of the being before the judgment seat of God. Both women became secular Franciscans along with their son and husband. They converted the Oldo mansion into a chapel and center for prayer. They spent the rest of their years working with the sick and the prisoners taken in the civil war that devastated Lodi. James gave up his old lifestyle and did penance for his sins. His acts of penance became so severe that his bishop had to order him to eat at least three times a week. He cared for a sick priest, who taught him Latin. Upon the death of Catharine, James himself became a priest. James became an excellent preacher whose life and words moved many to enter the religious life. He displayed the gift of prophecy by predicting wars and the timing of his own death. James focused on caring for the sick and for prisoners of war. He died in 1404 after contracting a disease from one of his patients. When his body was moved seven years later, it was found to have suffered no corruption. Anselm may, with some justice, be considered the first scholarly philosopher of Christian theology. In Anselm, one finds the special characteristics of scholastic theological thought: a recognition of the relationship of reason to revealed truth, and an attempt to elaborate a rational system of faith. 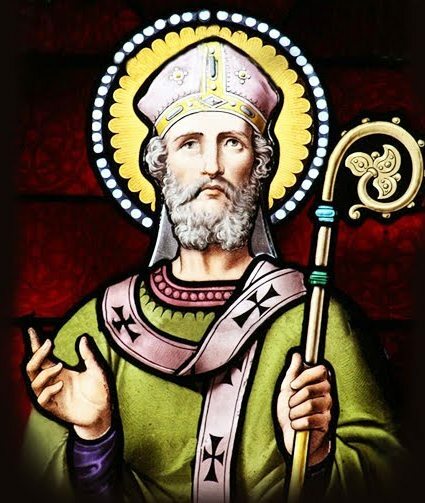 Anselm’s constant endeavor was to render the contents of the Christian consciousness clear to reason, and to develop the intelligible truths interwoven with the Christian belief. The necessary preliminary for this is the possession of the Christian consciousness. “Neque enim quaero intelligere ut credam, sed credo ut intelligam. (“Nor do I seek to understand that I may believe, but I believe that I may understand. The groundwork of Anselm’s theory of knowledge is contained in his tract “De Veritate” (lesser known than his seminal work “Curs Deus Homo”), in which, from the consideration of truth as in knowledge, in willing, and in things, he rises to the affirmation of an absolute truth, in which all other truth participates. This absolute truth is God Himself, who is therefore the ultimate ground or principle both of things and of thought. The notion of God comes thus into the foreground of the system; before all things it is necessary that it should be made clear to reason, that God should be demonstrated to have real existence. The scars that prove the truth of your body? “Little man, rise up! Flee your preoccupations for a little while. Hide yourself for a time from your turbulent thoughts. Cast aside, now, your heavy responsibilities and put off your burdensome business. Make a little space free for God; and rest for a little time in him. Enter the inner chamber of your mind; shut out all thoughts. Keep only thought of God, and thoughts that can aid you in seeking him. Close your door and seek him. Speak now, my whole heart! Speak now to God, saying, I seek your face; your face, Lord, will I seek. And come you now, O Lord my God, teach my heart where and how it may seek you, where and how it may find you. Lord, if you are not here, where shall I seek you when you are absent? But if you are everywhere, why do I not see you present? Truly you dwell in unapproachable light. But where is unapproachable light, or how shall I come to it? Or who shall lead me to that light and into it, that I may see you in it? Again, by what signs, under what form, shall I seek you? I have never seen you, O Lord, my God; I do not know your face. What, O most high Lord, shall this man do, an exile far from you? What shall your servant do, anxious in his love of you, and cast out far from your presence? He is breathless with desire to see you, and your face is too far from him. He longs to come to you, and your dwelling-place is inaccessible. He is eager to find you, but does not know where. He desires to seek you, and does not know your face. Lord, you are my God, and you are my Lord, and never have I seen you. You have made me and renewed me, you have given me all the good things that I have, and I have not yet met you. I was created to see you, and I have not yet done the thing for which I was made. And as for you, Lord, how long? How long, O Lord, do you forget us; how long do you turn your face from us? When will you look upon us, and hear us? When will you enlighten our eyes, and show us your face? When will you restore yourself to us? Look upon us, Lord; hear us, enlighten us, reveal yourself to us. Restore yourself to us, that it may be well with us, yourself, without whom it is so ill with us. Pity our toilings and strivings toward you since we can do nothing without you. –St. 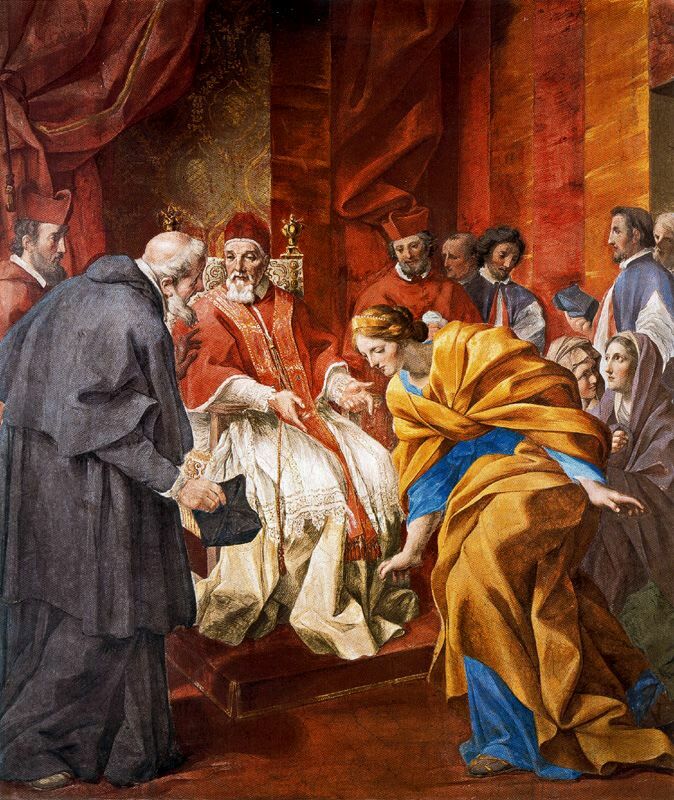 Anselm meets the Countess Matilda—the defender of Pope St. Gregory VII—in the presence of Pope Urban II, by Giovanni Francesco Romanelli, (1610-1662). and to teach the sublime truths You have revealed. Born in Narbonne, Gaul (modern day France), Sebastian was the son of a wealthy Roman family. He was educated in Milan and became an officer of the Imperial Roman army. As a favorite of the Emperor, Diocletian, he was appointed captain of the Praetorian guard, the Emperor’s personal soldiers. During Diocletian’s persecution of the Christians, Sebastian visited them in prison, bringing supplies and comfort. He was reported to have healed the wife of a brother soldier by making the Sign of the Cross over her. He converted soldiers and a governor. 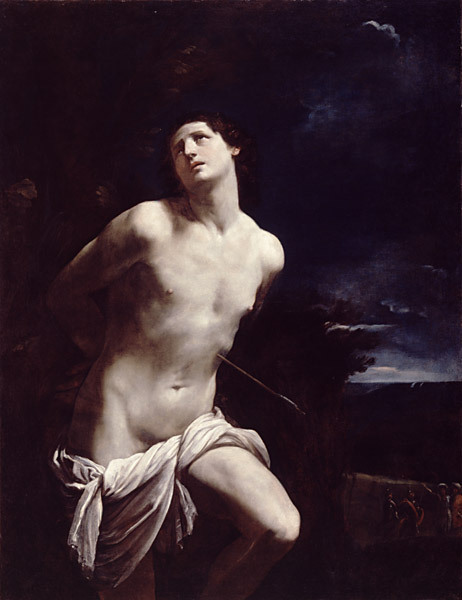 In 288 AD, charged as a Christian, Sebastian was tied to a tree, shot with arrows, and left for dead. He survived, recovered, and returned to preach to Diocletian. The emperor then had him beaten to death. His body was thrown into a sewer. Dear Commander at the Roman Emperor’s court, you chose to be also a soldier of Christ and dared to spread faith in the King of Kings – for which you were condemned to die. Your body, however, proved athletically strong and the executing arrows extremely weak. So another means to kill you was chosen and you gave your life to the Lord. May athletes be always as strong in their faith as their Patron Saint so clearly was in his. Amen.